Former River Cafe chef Jonathan Conroy and author of 'The Kitchen Orchard' Natalia Conroy launch The Urban Orchard & Partners this winter 2014.
http://www.theurbanorchard.co.uk. Jonathan and Natalia Conroys' Urban Table, Urban Feast and Urban larder, bring formal and informal food to your home. Formal and Informal food in your home. The Urban Orchard and Partners. Jonathan and Natalia Conroy are private chefs who have recently formed The Urban Orchard and Partners, a bespoke service, bringing formal and informal food to your home. Both delivery and on site services are available for clients in London. Jonathan has over 15 years experience having worked in London's The River Cafe, J. Sheeky's , Rick Stein's, Petersham Nurseries as well as others. 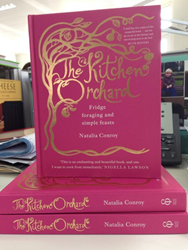 Natalia has worked in London's The River Cafe, is the owner of The Orchard Canteen ltd, and the author of 'The Kitchen Orchard', Ebury Press 2014. Contact http://www.theurbanorchard.co.uk for further details.